Microchip have launched their new Peripheral Component Interconnect Express® (PCIe®) 3.1 perfect for embedded and automotive platform designers who are seeking Low-Power Sub-State (LPSS). L1.1 and L1.2 for power savings now have new options available today from Microchip Technology Inc. (Nasdaq: MCHP). The LAN7430 Ethernet bridge provides integrated power, clocks and an Ethernet physical (PHY) interface while the LAN7431 provides Reduced Gigabit Media-Independent Interface (RGMII) for alternative PHYs and switches. The LPSS L1.1 (snooze) and L1.2 (off) enables designers to reduce power consumption and improve battery life by snoozing or turning off the high-speed circuits in the PHY when not in use. For more information visit www.microchip.com/LAN7430. When connected to an application System on Chip (SoC) or processor as host, the LAN7430/1 allows the host device to deliver audio, data or video data through the 10/100/1000 Ethernet network. Connection to the host is achieved via the PCIe 3.1 specification, providing up to 2.5 Gigatransfers per second (GT/s) in each direction simultaneously. The LAN7431’s RGMII interface allows the freedom to design with alternative link layers such as IEEE 802.3bw-2015 (100Base-T1) for 100 Mbps and 802.3bp-2016 (1000Base-T1) operation over a single twisted pair cable. It also provides support for real-time Ethernet, IEEE 1588-2008 (PTP) and IEEE 802.1AS (gPTP) Precision Time Protocols. The LAN7431 offers an automotive variant that exceeds AECQ100 Grade 2 (-40°C to +105°C) qualification. With the new offering, Microchip provides customers using PCIe Ethernet bridges design confidence through product longevity, worldwide technical support, design review services of final designs and fully released drivers for Linux® or Windows® operating systems. Microchip’s customer-driven obsolescence practice is a philosophy that helps ensure that as long as demand exists for any product, Microchip will make efforts to continue providing it. “In a market where many vendors are either announcing end of life on a current product or sending messages that indicate potential longevity issues, Microchip is stepping in to meet customer demand,” said Charles Forni, director of Microchip’s USB and networking business unit. “The new devices also meet customer requirements of PCIe 3.1, low-power sub-states for power saving that is important in automotive, but especially so for hand-held or single-board computers in industrial applications.” A true single-chip solution, the LAN7430/1 family offers single 3.3V supply operation, removing the need for complex and costly power management support. Both devices integrate a JTAG (1149.1) Test Access Port (TAP) for enhanced test coverage. Microchip also offers LINK MD® diagnostics utilizing Time Domain Reflectometry (TDR) to analyze the cabling harness, identifying and locating common cabling problems such as open circuits, short circuits and impedance mismatches. 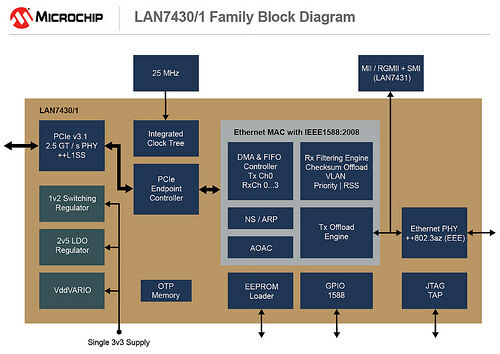 Development Tools The LAN7430 and LAN7431 are backed by Microchip’s free LANCheck® online design review service that reviews customer designs, ensuring that best design practices are used. Microchip’s MPLAB® Connect software tool is provided for programming One-Time-Programmable (OTP) memory, or the optional EEPROM memory, for easy device configuration. Microsoft Windows Hardware Quality Labs (WHQL) certified drivers are available along with Linux mainline kernel drivers for both networking and PTP and gPTP synchronization. Evaluation boards (EVB-LAN7430 and EVB-LAN7431) are also available.